Laboratoire de traitement de signal et de l'image du Centre de Soudage et de Contrôle. Route de Dély-brahim - BP64 - Chéraga - Algérie. In this paper we propose to apply radiographic tangential method for corrosion and deposit evaluation in pipes. Automatic method based on image processing is developed in order to improve wall thickness measurements. The application of this method on small and large pipes diameters (2 inches to 6 inches) is shown and results are discussed. The reliability and the safety of industrial equipment in the petroleum industry and power plants are substantially influenced by degradation processes such as corrosion, erosion, deposits and blocking of pipes, which might reduce production, cause leaks, fires or unpredictable and costly shutdowns due to repair and replacement. The condition of critical components in these industries can be monitored by the proper use of NDT inspection methods even while the plant is in operation, thus making possible the planning of components replacements, repairs, deposit removal and shutdowns. Preventive and corrective maintenance averts the environment and the public from excessive risk of industrial disasters. One of the most important parameters in a piping or pipe-line to be monitored and measured is the wall thickness. Only radiographic method assures inspection without costly removal of insulation material during operation of the plant. An additional advantage is that these techniques can be even applied in high temperature environments. Radiographic evaluation of the deposits/scales in pipes (insulated or not) is also an effective NDT technique. 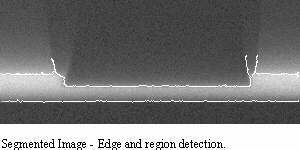 This radiogram is examined by radiography interpreters whose the task consists in measure and quantify wall thickness. Because of the bad contrast and high unsharpeness of the radiogram quality, make difficult their job, the wall thickness evaluation in these conditions is submitted to human judgement. To apply radiographic tangential method for corrosion and deposit evaluation in pipes. To develop automatic method based on image processing in order to improve wall thickness measurements. To show application of this method on small and large pipes diameters (2 inches to 12 inches). We describe the tangent method of X and gamma ray to determine tubes thickness. This very delicate method requires a meticulous setting of parameters of cliché hold (time of exposure, distance source-film, energy, ...). The principle of this method is described on the figure 1. being given a radioactive source used in industrial radiography as the iridium 192. It is about exposing tube to this source to inspect while holding in amount of certain parameters. To be able to decrease the effect of fuzzy, studies showed that the operator should use SFD superior to 8 times tube diameter. This angle is function of SFD and insulation thickness. Once parameters of shoot applied and film developed, it will be proceeded to its interpretation and evaluation of tube thickness. Figure 1 shows the apparition of two walls with the presence of different types of corrosion (deposits, uniform corrosion or ). We will give examples of detected corrosion. Where Ta is the measured thickness on the radiogram. The calculation of tube thickness is achieved while using the step being on film. Laws of rays absorption in materials are exponential type, it is necessary to calculate an inverse logarithmic law permitting to read tube thickness according to the density in every point of radiogram. The exploitation of radiograms can be done from the interpretation of film on negatoscope by an operator. This one determines external and internal diameter limits of the pipe in order to measure, manually, thickness in areas of maximal corrosion. Effect of geometric projection of the fact that the film is not plated on the tube (insulated). This, bring us to develop techniques of images analysis in view of palliating to these problems and to give back a method more efficient and more precise. Extraction of corroded zone (Segmentation). Quantitative analysis in the evaluation of thickness profile. Once radiogram developed, is digitized by a specialized scanner of AGFA type on 256 levels of grey. On the images digitized, one can only distinguish about fifty Grey nuances when the image is displayed on a screen video. The enhancement of contrast permits us to choose a small range of grey and to amplify differences of luminance between them, improving so the visibility of weak contrast details. The extraction of the zone corroded is the most difficult step to achieve since it is often based on the complex mathematical concepts. Our research team have developed a very robust segmentation algorithm permitting to put in value zones of the image reached by the corrosion. Of a brief manner, the method used so-called co-operative , takes in consideration advantages of the segmentation in regions and in contours. What makes, the detected zones are well defined and exact positioned. The last step consists to measure thickness and to draw its profile according to the tube length. We have prepared and made two types of samples. Several tubes are cut up in 300 mm of length with 1, 2, 4 and 6 inches diameter. Internal and external grooves (longitudinal and transversal) are manufactured to permit a simulation corrosion. Other tubes have sudden a local attack by an acid to permit the obtaining of a local corrosion. All alternatives are taken in amount: straight or bent, reinforced tubes either no, insulated either no. In this article, we have taken steel as material of work. The second type of tube has been appropriated from industrial installations containing a real corrosion: erosion, deposits or pits. We constituted a share of samples permitting different tests and holding amount of all cases that we can find. In order to present results, we chose some films among so many others. 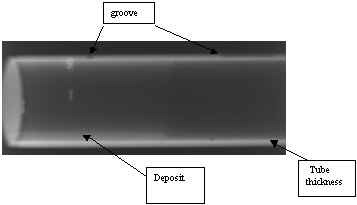 Figure 2 shows the radiogram of a tube presenting a deposit in which has been manufactured some grooves. Figures 3 shows radiogram of a tube containing a real corrosion "pits". This work is a co-ordinate research project between our Research Centre and International agency of Atomic energy. It is a group of work regrouping several countries in the goal to proceed to tests of the so-called method and to propose a inspection procedure and evaluation thickness of corroded tube without removing the insulating. W.S. Burkle. "Application of the tangential radiographic technique for evaluating pipe system erosion/corrosion.". Material evaluation. Vol. 47, 1184,Oct. 1989. S. Lee, Y. H. Kim. "Determination of pipe thickness using tangential radiography and film density-thickness correlation. ", Rapport AIEA, Syria 1999.